Solar lights are becoming perfects solution for lighting these days. Either it is indoor lights, outdoor lights, garden lights, street lamps, emergency lights or spot lights; solar power operated models are replacing mainstream electricity model of almost every kind of lights. On the market there are plenty of models available from which you could choose one according to your requirement. Here we are going to suggest you something for making your outdoor more beautiful and exquisite. A solar power operated outdoor LED spot light unit by Amir, a perfect solution for the people who wants to expenses less and wants more. So let examine more aspects of this product and figure out how it could be more or less useful as a outdoor lighting solution. 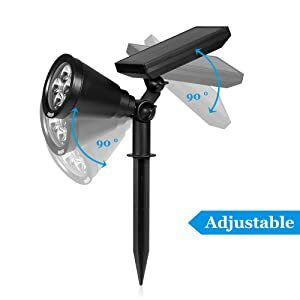 Amir solar powered this LED spot light can be used as a outline of your garden, pathways or yards, or you can choose it for highlighting your outdoor stairs or any other outdoor unite. This is also best for the people who want a concentrated beam for illuminating any objects in garden or yard. With almost no maintenance charge and easy installation makes this LED spot light more unique as compare to other same alike products. It can also be used by many ways, either you can stick this unite in to the ground of soft soil like garden or can easily mount to the walls with screw. Beams of this spotlight are adjustable so you can easily spot it on the unit for illuminating that. Newest upgraded version in 2015, better than previously released version. For absorbing more sunshine and reduce battery charging time it uses bigger solar panel. Adjustable design gives you freedom to changing spotted objects or paths. Multi mode installation option, by which you can easily use it whether it is a garden or porch. Life span of the battery is about 3 years so no need to worry about changing it so often. LEDs offers 200 lumen output to shine brighter light. Angle is adjustable within 180 degree, which makes it easy to use without changing setup. Installation can be done in many ways. Offers two modes of lighting – high light and dim light mode. Fully water resistible, so almost no possible damage by water. Each LED is 10mm uses 0.5 watt and delivers up to 6500 colour temperatures. Battery can last up to 8 to 14 hours on a single charge. Amir LED spot light is best solution for any outdoor lighting or decorative need. This is perfect for garden lighting, lighting up your pathways, decks, patios, stairways etc. This LED spotlight comes with inbuilt quality LEDs. Each LED is 10mm and consumes up to 0.5 watt. It can provide 200 lumen flux for brighter results. Unit is easy to fix and use, can be easily adjusted and rotate within 180 degrees which is quite sufficient to cover almost every unite of a side. This LED spot light has two modes for operating, one is High light mode which offers full capacity of LEDs and draw batteries in just 8 hours and second one in dim light mode which use a compatible dim light but saves battery and could light us up to 14 hours. Life of inbuilt batteries is up to 3 years and water resistivity quality makes give it freedom to use any outdoor space. There are some reviews where buyer claiming that light doesn’t work properly. So here is my advice to charge the unite at least for 8 hours before first use to avoid such kind of malfunctions. 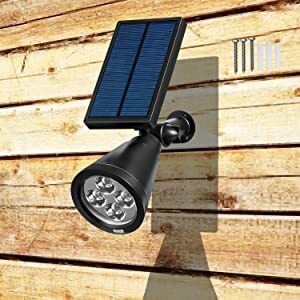 Amir solar operated LED spot light is good and worth picking, fulfils almost every need of outdoor decoration and lighting that is why more than 64% buyers awarded it with 5 star rating. 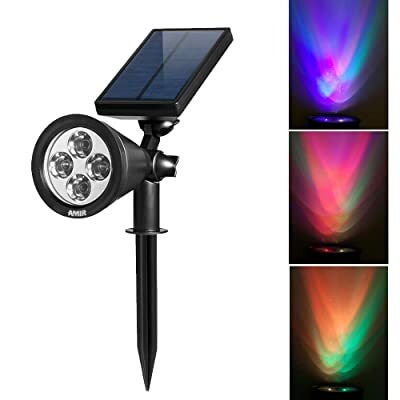 Fully solar operational this light can turn your gardens or pathways in to a beautiful and location without putting any extra burden on your electricity bill. This is unique and beams are so attractive to impress you just in single time use. Click here to buy the product.